As we’re flooded with “back to school” specials and messaging across most areas of the U.S., the team at Real Estate Portal USA is reminded how critical a school district can be in a real estate search. Although there has been no conclusive evidence linking school districts to the success of a child, there is undoubtedly value in buying a home in a community with a highly rated school district. A recent realtor.com® survey of people who closed on a home this year found that 73% said buying in a good school district was “important” in their search. So can you imagine buying a house only to find out your new home isn’t in the school district you expected? How do real estate agents know with 100% certainty which school district the property is in? In many areas of the US, school district boundaries can change depending upon which side of the street you’re on and two adjacent properties could be in two different school systems. Whether you want a highly rated school system to protect the resale value of your home purchase, or you have children that will be attending school, the school district is an important factor to your home purchase and not always easy to decipher. Luckily buyers and real estate professionals can easily identify which school district a home is located in by searching our national parcel database. When home buyers work with a Realtor® using GIS tools and parcel data like ReportAll, they benefit from the school district data provided by their real estate agent. However, when a home buyer is relocating from another state or country, and in the early stages of research, they may not be working with a real estate agent yet. Identifying the school districts of multiple property parcels across a variety of counties and states in the US can be time consuming. Imagine someone relocating to a US location from India and trying to choose between the suburbs of Denver, Seattle or New York. When which school district the property is located in is a deciding factor you want instant, regularly updated property information. 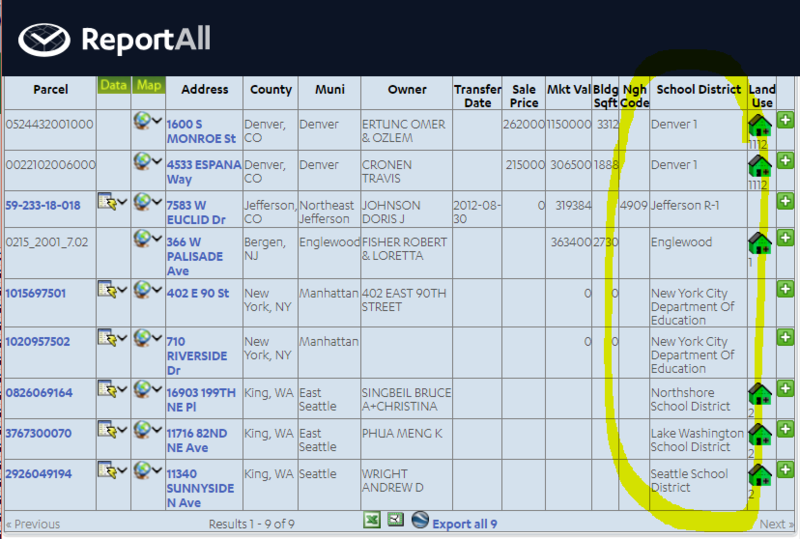 With ReportAll Online, that user can secure a day pass for $2.99, input multiple addresses across the US into our national parcel database and generate a table listing school district and other parcel data, as well as online property lines, all from one portal (example illustrated below). If you are relocating and doing research across multiple states and counties, the national parcel database solutions created by Real Estate Portal USA provide low cost, instant access, reliable parcel data including the school district each property is located in. ReportAll Online: Access our parcel database with property lines and school district information directly from your desktop. Instant nationwide access is only $2.99 a day. Next How Do You Identify a Property When Disaster Strikes?